Its now been a few months since I did my activity tracker review testing four devices simultaneously. I determined that the Fitbit One was the best tracker for me* although I also did like the Jawbone Up quite a bit. 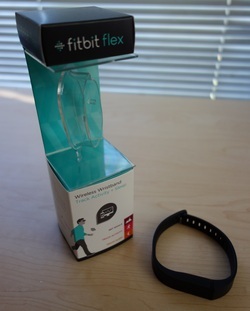 I have since switched from the Fitbit One to the Flex and now use that tracker exclusively. Most of the reasons I chose to switch from the One to the Flex were functional. It became a bit tedious for me to have to remember to move the One after every wardrobe change and I wasn’t a fan of having to remove the device from the belt clip to the wristband at night either. With the Flex both of those issues are now gone and I can even wear it in the shower. I also feel that the Flex has been the most comfortable of all the wrist based trackers I tested feeling much more comfortable than the Fuelband and a little nicer than the Up. The watch clasp fine tuning is definitely a contributor to that along with the material and weight of the device. One issue I have with the sleep tracking is that I sometimes forget to turn it on at night or in the morning but I have found that I can manually log my sleep correctly in those situations by going into the old dashboard interface. I haven’t figured out a way you can access that feature in the new one. I wish the Flex had the ability to sense when you wake up automatically the way the Jawbone Up can. Also a missing feature I’d like to see is native support in IFTTT for the Fitbit which the Up has. I don’t miss the lack of the altimeter sensor as I didn’t use that on the one. I track my hikes in Runkeeper and I didn’t personally get any value from tracking that data. Other than that I don’t have much else to report at this time. Other trackers that I’d like to test in the near future are the Withings Pulse, the Basis, and the Misfit Shine. * I often get asked what is the best activity tracker and after testing 4 simultaneously I can tell you that there is no simple answer to that question. Everyone will have different needs that will be better suited by a particular device. I tried to provide that informational breakdown in my review. Don’t forget about the amiigo when it comes out. Definitely looks like an interesting alternative. Yes Rob I did forget to mention the Amiigo which sounds like a good tracker with it’s extra method to track foot activity. However the so data visualization, reporting, and insights provided by these is becoming even more important than the hardware as well. Providing an API and having it incorporated into third party apps and services is also critical for new devices. You might want to look at the new Polar Loop. Seems to overlap activity trackers but also stake out a new turf. The only thing is it uses the wordpress channel so u cant use both. Using these gadgets is always an advantage. Helps you keep track of your routine, the workout you do on daily basis. Always good to know how much progress you have made.